Tracy Flickinger is a nationally recognized artist from the Greater Boston Area who studied at the University of New Hampshire. She has been a licensed commercial artist for the past 26 years. Her work graces a number of products, from home decor and textiles to children's furniture. 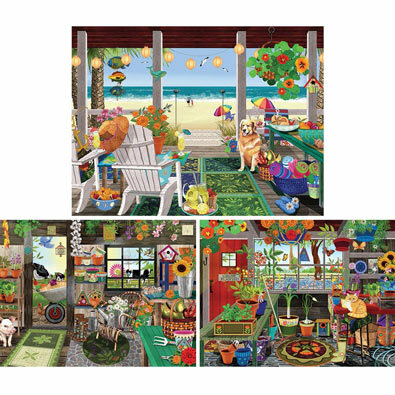 Each 300 oversized piece puzzle has easy to handle pieces for any age and level of puzzler and measures 18" x 24". Tracy Flickinger is a nationally recognized artist from the Greater Boston Area who studied at the University of New Hampshire. She has been a licensed commercial artist for the past 26 years. Her work graces a number of products, from home decor and textiles to children's furniture. This 300 oversized piece puzzle has easy to handle pieces for any age and level of puzzler and measures 18" x 24".